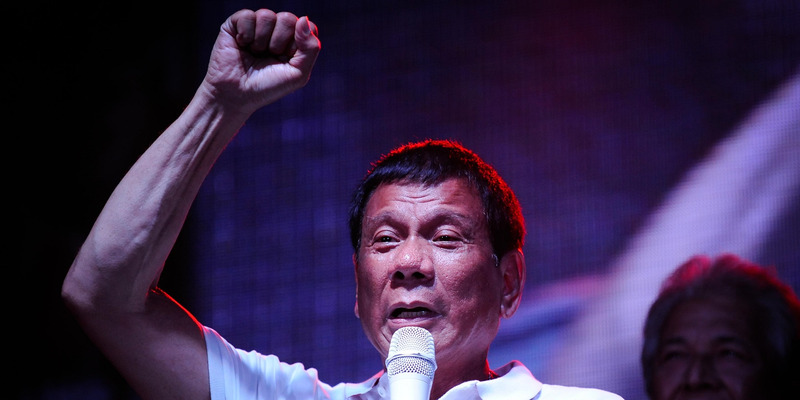 Dondi Tawatao/Getty ImagesPresident Rodrigo Duterte. Cambridge Analytica’s parent company SCL Group claimed it was behind Philippine President Rodrigo Duterte’s election-winning “man of action” image. Now-deleted briefs from the company’s website implied it refashioned Duterte’s persona from kind and honorable to one focused on toughness. Cambridge Analytica’s parent company may have helped reinforce Philippine President Rodrigo Duterte’s tough-guy image to help him win the nation’s presidency, according to deleted documents. SCL Group, the entity which controlled Cambridge Analytica, appeared to once boast on its website that it had been a crucial player in Duterte’s 2016 election victory, driving a campaign promising a violent crackdown on crime. It does not name Duterte directly, but the link seems clear. “In the run up to national elections the incumbent client was widely perceived as both kind and honorable, qualities his campaign team thought were potentially election-winning,” the site reportedly said. While SCL group claims to have rebranded Duterte as a “tough” candidate, he had already garnered a notorious reputation while serving seven terms as mayor of Davao City; the leader once admitted links to local “death squads,” who executed over a thousand people involved in the drug trade during Duterte’s rule. Duterte certainly amped up his tough rhetoric with the implementation of a bloody “war on drugs” shortly after being elected in 2016. Local and international groups have called to investigate the killing of thousands of Filipinos by police units since Duterte took office, with rights groups claiming the death toll could be over 12,000. A map of SCL’s worldwide offices still lists Manila as an area of operation. Duterte and his government have not yet commented on any potential links to the SCL group. Prior to the 2016 election, Cambridge Analytica’s now-suspended CEO Alexander Nix, who is also a director of SCL, gave a speech to members of the Philippines’ press club in Manila, according to the Post. According to The Manila Times, Nix claimed that his company had seen a “100% success rate” in election campaigns around the world, including Asia, Africa, and Europe. Nix bragged that the data firm could get an otherwise “fundamentally flawed” candidate elected easily by highlighting their positive traits. “Even if you have just one staggering likeable trait, given the right combination of strategies, you could win an election against a very formidable opponent,” Nix said. Several people with knowledge of Cambridge Analytica’s campaigns have said that Nix was known to greatly exaggerate the company’s methods and abilities. The political-research company is currently at the center of a massive Facebook data scandal, which may have exposed the personal data of up to 87 million users to Cambridge Analytica. Nix was suspended as CEO of the company last month as the company continued to grapple with the mounting scandal. Cambridge Analytica has recently garnered attention for its role in helping Donald Trump’s 2016 US presidential campaign and its social media strategy. The company’s executives were caught on tape boasting about helping secure Trump’s win. Other political actors in several countries, including St. Kitts and Nevis’ and Nigeria, may have also used SCL Group and Cambridge Analytica’s services to help election campaigns.